Please select an option 9 8 7.5 9.5 8.5 7 Please select a size. 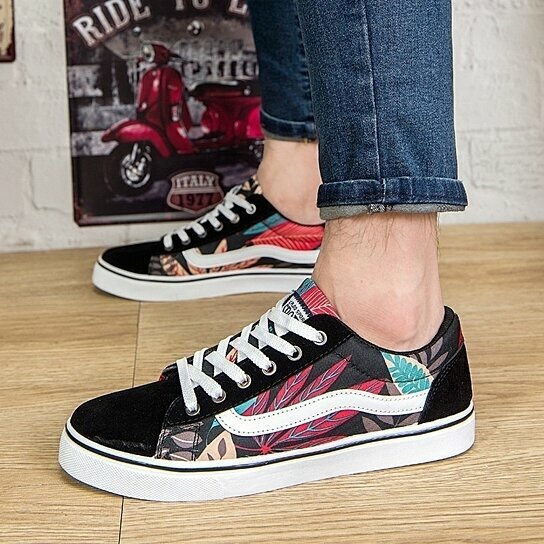 ��Upper Material: Canvas ��Toecap: Round head ��Style: The fashion leisure ��Feature:Breathable ��Popular element: Car suture, Flowers ��Size Table: US7=UK6=EUR39= Footlength 24.5cm(9.6 inches) US7.5=UK6.5=EUR40= Footlength 25cm(9.8 inches) US8=UK7=EUR41= Footlength 25.5cm(10 inches) US8.5=UK7.5=EUR42= Footlength 26cm(10.2 inches) US9=UK8=EUR43= Footlength 26.5cm(10.4 inches) US9.5=UK8.5=EUR44= Footlength 27cm(10.5 inches) ��If you wear the size of sneaker is 7, you can choose the size of the shoes 7. ��If you wear the size of Leather shoes is 6, you can choose the size of the shoes 7 . ��If your feet is bigger than normal wide, based on the above conditions, we recommend that you choose a big one yard! �� For reference only, please according to your actual foot long to select the correct size.I wish you a happy shopping! ��The parcel will be shipped within 24 hours once we receive the order. ��If you have any quetions, pls feel free to contact us, we're happy to provide service.